We offer a great quality 100% soft cotton waffle weave bathrobes for next day delivery service. These waffle bathrobe are light weight are very soft to the skin making it ideal for summer, spa or after saunas. These soft to the body Waffle robes offer the luxury look and feel to the bathrobes which are seen in the best spas, around pools and hotels. If you are a hotel looking for a waffle robe with your hotel logo embroidered then we can offer some great embroidery prices. Our stocked waffle bathrobes means we can turn around custom robes very quickly. These robes have a front pocket which is also an ideal position for embroidery. 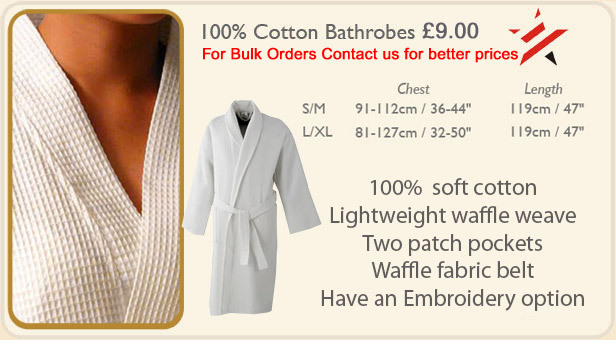 To send order to main land UK then delivery charge for waffle bathrobes is only £6 (for up to 20 waffle bathrobes). Since waffle weave bathrobes are more compact than the terry bathrobes this means we can fit more in one box hence customers benefit more on carriage.